Wood Pellets are a biomass product made by compressing waste wood, grasses, straws, corn stalks, even paper and cardboard into a dense pellet like form. Traditionally, trees were chopped and sawn to make firewood which was then burned, releasing its energy for heating or to boil water. Although we have been burning firewood for thousands of years, the problem with this that we need an enclosed area to store the chopped firewood to keep it dry. Also, burning firewood in a wood burning stove may look nice but is inefficient as the wood may be wet and does not provide enough heat throughout the home, and once burnt it produces a lot of ash and resides which need to be cleaned. Cutting down trees and burning wooden logs uses up our natural resources as well. 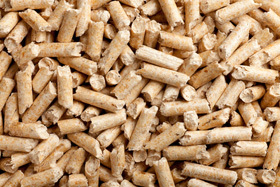 Wood fuel pellets can be used as a home heating fuel in biomass boilers or special pellet burning stoves. Pellet stoves are better than regular open wood fireplaces, because they burn cleaner with much less smoke and soot. Because wood pellets are extremely dense and contain a low moisture content (lower than 10%) means that the pellets can burn in the stove at a very high combustion temperature with improved efficiency and much lower ash content (less than 2%) compared to burning conventional firewood. As the cost of heating our homes using fossil fuels, such as heating oil and natural gas increases, more and more people are looking at pellet heating as a serious alternative. A large number of pellet stoves, forced hot air heating furnaces and wood petted burning boilers are all available on the market to take advantage of this new biomass heating material. In some countries they are mixing and co-firing wood pellets with coal to produce electricity. Commercially sold wood pellets are usually made in large pellet mills from recycled biomass wastes which is then compressed and extrude into pellets. But small domestic sized pellet mills are starting to become more common and affordable even for home owners. With the ability for people to make their own wood pellets at home, pellet stoves either for home heating or as part of a fireplace now have more appeal than ever. Making wood fuel pellets is a little more advanced than just chopping up firewood, but with a little knowledge of how to make your own wood pellets and have the right tools it’s not that difficult. The first step to make your own wood pellets is to get your raw material. This can be waste wood or a variety of different renewable sources and other forms of biomass. The material needs to be broken into small pieces small enough to fit through your pellet mill’s die holes for extrusion. Pelleting machines compress the raw material at high pressure and temperature so the biomass materials may need to be dried first to lower their moisture content. For the best quality pellets your material should be about 15% moisture content. For some materials you will have to add binders such as vegetable oil in order to bind the pellet together. But with many softwood materials like pine and spruce they contain enough natural occurring agents to bind the pellet together. The high density of the finished wood pellets allows for convenient handling, bagging and efficient storage. Prices of pellet stoves vary and can cost well into the thousands, but wood pellets are fairly reasonable to buy, and a little can go a long way reducing your payback period. Pellet stoves are easy to load and becoming more affordable each day so you should check with your local dealers to get a good idea of what is available and how much your installation and running costs are going to be. making your own biomass pellets can be classed as a green energy fuel source, in the sense that it is a carbon neutral source of energy. Carbon is consumed during the life cycle of the tree or organic crops and then released again once the pellets are burnt. Wood pellets emit lower emissions and greenhouse gases compared to burning firewood helping us to tackle the problems associated with climate change. With the right knowledge and a pellet mill you can make your own pellets for yourself and your friends or even start a profitable wood pellet business as a pellet stove can be a remarkably efficient way to warm up your property and keep your family warm this wintertime. To gain a better understanding of how to make your own wood pellets or how to use “Biomass Pellets”, or to obtain more information about the various biomass pelleting systems available, or to explore the advantages and disadvantages of using wood pellets as a bioenergy, then Click Here to get your copy from Amazon of one of the top “Wood Pellet and Biomass Guides” today to learn more about making biomass pellets to burn in your home to save money and the environment. I am looking at buying a house which is not connected to mains gas, so the best option seems to be getting a biomass boiler installed in a separate outbuilding. So rather than randomly trawling the web can anyone recommend a Biomass boiler/burner. Is the Woodviking Biotriplex better than the Ulma burner.